Windows 8.1 How Can I make Desktop Internet Explorer my default browsing experience? Start from Windows 8.1, the metro internet explorer is the default one for website browsing. 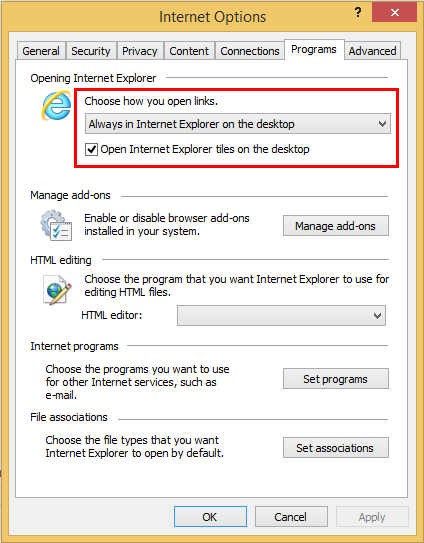 You can following these steps to make Desktop Internet Explorer for default browsing experience. In Open Internet Explorer settings, change Choose how you open links option to Always in Internet Explorer on the desktop. Click OK to save the Internet Explorer setting changes. SkyDrive has been fully integrated into the RTM version of Windows 8.1 so its system level settings are now in PC settings. Tap or click the Settings charm (or press Windows key + I). In the Settings pane, tap or click Change PC settings in the lower-right corner. Tap or click SkyDrive. 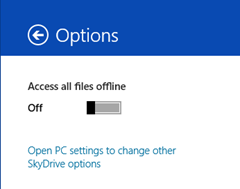 You may have to press the Back button in the Settings pane to see the SkyDrive settings. Enter Internet Explorer, and then tap or click Apps. In the search results, swipe down on the Internet Explorer icon, and then tap Pin to Start. You might notice in your Surface RT, the time is showing 1 hour ahead of the actual even with the correct Time Zone selected. The root cause is the internet clock was not sync correctly. Update: actually step #2 & 3 is not necessary, when you go to store, you can just start typing and search will automatically come up. You can even do same in the start screen! 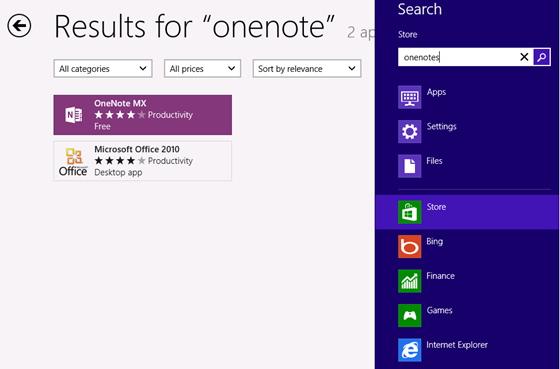 Screenshot for searching OneNote in Store. In Windows 8 You can configure IE10 to always open in the default Metro style or in Internet Explorer for the Desktop, as you prefer. If you are using a Metro version of IE, when viewing a site in IE10, click Page Tools and select View on the desktop. Click Tools, and select Internet options. Click to display the Programs tab. In the Opening Internet Explorer section, select the default option you desire from the menu, and then click OK. There are 3 IE launch options. This option will choose which version of IE to open depending on the context where the link was selected. Selecting a link from a Metro style-app will open the touch-optimized version of the browser. Selecting a link from an application or icon on the desktop will open the desktop version of the browser. This option is the default. Links from all apps, including desktop apps, will open in Metro version of IE. The only exception here is IE icons and Internet shortcuts on the desktop. Links from all apps, including Metro style-apps, will open Desktop version of IE. Boot from the Windows 8 media (USB, CD, etc.). At the Install screen, press Shift+F10 to open a command prompt. Exit diskpart, and when you install Windows 8 you’ll be able to select your VHD volume (ignore the warning that you won’t be able to install). If this is an existing machine, and you want to dual boot rather than wipe the disk, then don’t perform the first three blocks of commands.